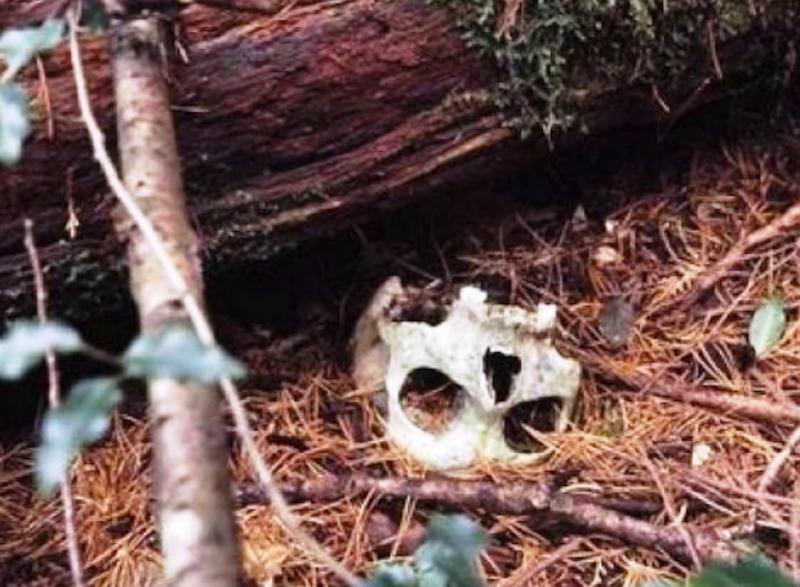 The Aokigahara Forest is a lonely place to die. So dense is the vegetation at the foot of Japan's Mount Fuji, it is all too easy to disappear among the evergreens and never be seen again. Exactly why so many choose to end their lives in the forest remains something of a mystery, though it has been suggested that the first among them were inspired by a novel set there. Azusa Hayano has studied and tended to the forest for more than 30 years. Even he cannot make sense of the trend. Such is the nature of his work, he is often faced with the grim task of uncovering suicide victims, or stepping in when he finds those for whom it is not too late. 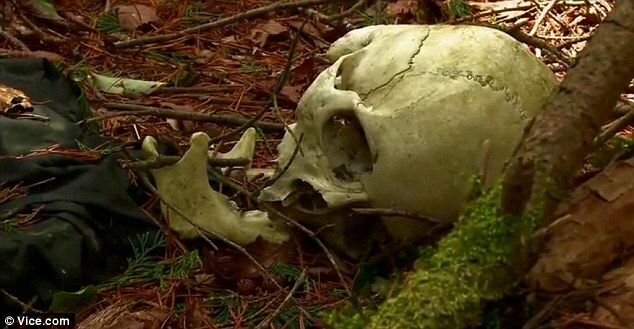 He estimates that he alone has stumbled across more than 100 bodies in the past 20 years. The middle-aged geologist took a film crew from Vice World deep inside the site known as 'Jukai' - the sea of trees - to share what he has learned. 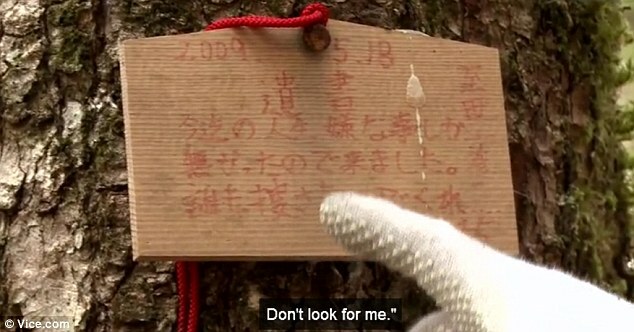 Though Mr Hayano is unable to give any definitive answer as to why so many kill themselves at Aokigahara, he has gained great insight into the behaviour of those desperate enough to venture in with no intention of coming back. In this haunting documentary he tells the film-makers how clues left among the trees can indicate what went through a person's mind in the moments before they took their own life - or, as is sometimes the case, had a change of heart and chose to live. His interest in death and despair may seem to stem from morbid fascination, but as the film rolls on it becomes clear that this softly-spoken, pensive man acts out of a desire to understand and prevent these tragedies. 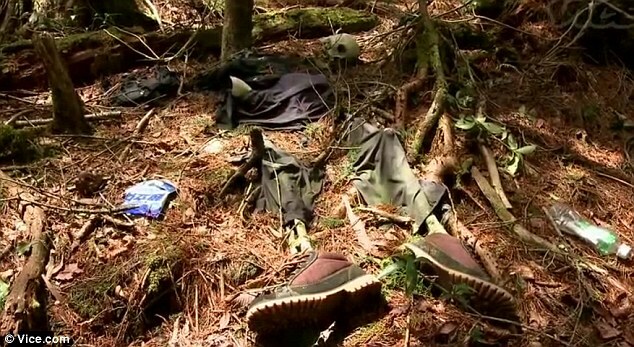 Though the footage includes disturbing stills of bodies found dangling in the forest, perhaps equally chilling are the possessions they leave behind, often signs of distress and indecision. The film opens with a car abandoned on the edge of the forest, a road map lying open on its front seat. Mr Hayano tells the camera it has been there for months. 'I'm assuming the owner of the car entered from here and never came out,' he says. Once inside, the crew passes a sign urging would-be suicide victims to think again. Positioned where a public trail turns into a cordoned-off area, for many it is the point of no return. Despite the alarming number of people who seem deaf to such pleas, there are those who change their minds. 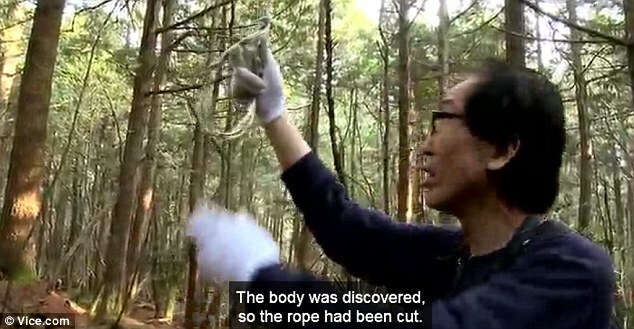 Unsure of whether they are ready to die, they often unravel tape behind them, Mr Hayano explains, using it like a breadcrumb trail to guide them back to safety. 'In most cases if you follow the tape you find something at the end,' he told Vice. At the end of one such trail, Mr Hayano finds a makeshift camp of tarpaulin and empty tents - evidence, he says, of hesitation. Though he finds no bodies there, a doll nailed to a tree is the remnant of a desperate episode. Suspended upside down with its faced torn off, it is not a prank, says Mr Hayano, but a curse. 'I think this person was tortured by society,' he says. Other unnerving finds include an embittered note nailed to a tree, a 'suicide manual' and a number of nooses. At one point, Mr Hayano spots a yellow tent pitched in the middle of a public trail. Inside is a young man who claims to be camping. But Mr Hayano, who tells the crew of the time he persuaded a man not hang himself, knows a suicidal person when he sees one. However, one final find confirms that there is simply no saving some people. 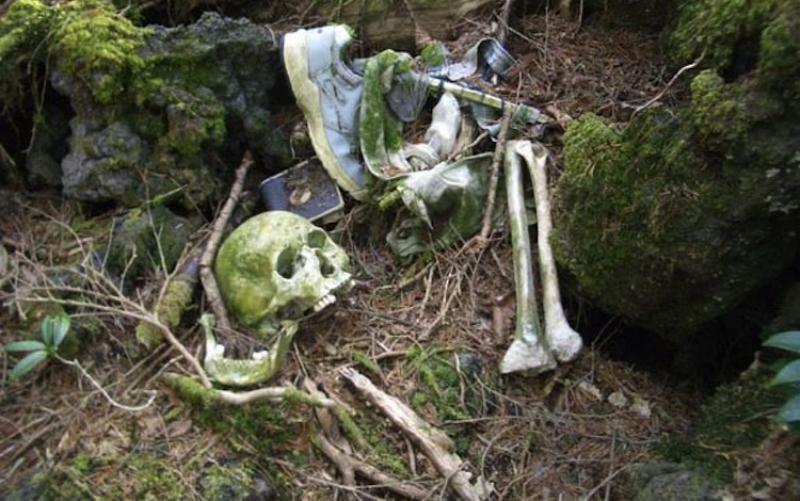 The discovery of a human skeleton, still in clothes and boots, makes for a grisly end to the film. Mr Hayano, for all his familiarity with death, appears shaken. His job has given him a unique perspective on those who kill themselves. For him, suicide in Japan has changed over the years. Whereas it was once the preserve of samurai, who would commit ritual 'harakiri' to preserve their honour, today it is merely a mark of social isolation in the modern world. 'I think it's impossible to die heroically by committing suicide,' he says. Mr Hayano believes it is a symptom of an increasingly impersonal and lonely way of life that emerged with the internet. Thanks for sharing. This thing have been going around for years, they are too stress. With the industries moving operation in cheaper countries, more and more japanese lost the jobs, and some just force to commit suicide. More commonly referred to as the Sea of Trees, Aokigahara is a forest of unbridled beauty and serenity. 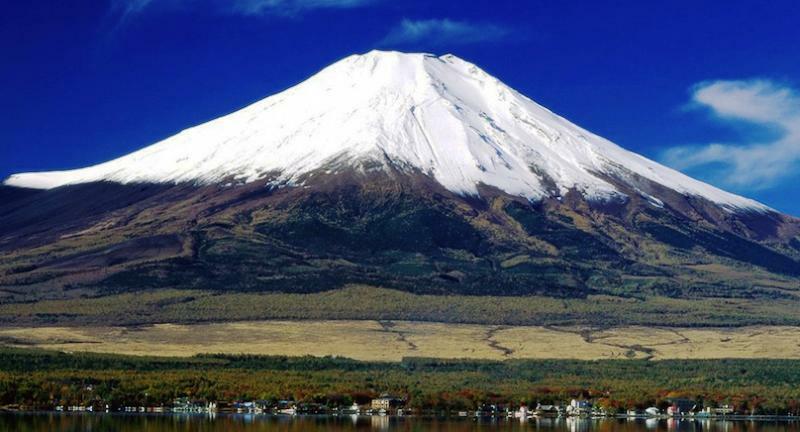 Upon entering the region, one must wade through a thicket of trees, slipping over the knotted roots and rocks, to access amazing vantage points to view Mount Fuji and explore hidden icy caverns. In the forest, one is also completely shrouded in darkness – save for the sporadic stream of sunlight from gaps in the treetops – and experiences an overwhelming silence, pressing in from all sides. As such, it’s a perfect place for solitude and reflection and correspondingly, is the perfect place to die. At least according to the 100 people who commit suicide here every year. 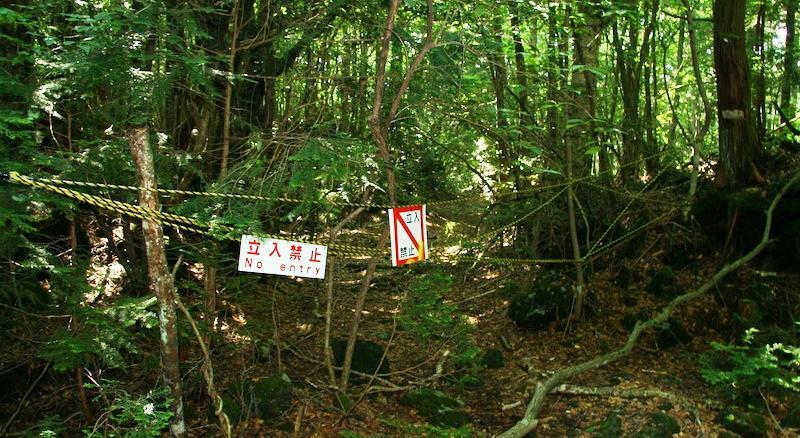 Aokigahara has always been dogged with morbid myths and legends. It is widely believed that the Japanese custom of ubasute, where an elderly relative is left to die in a remote location, was widely practiced in the forest. Aside from tales of ubasute, rumors of demons and hauntings in the forest are also pervasive. 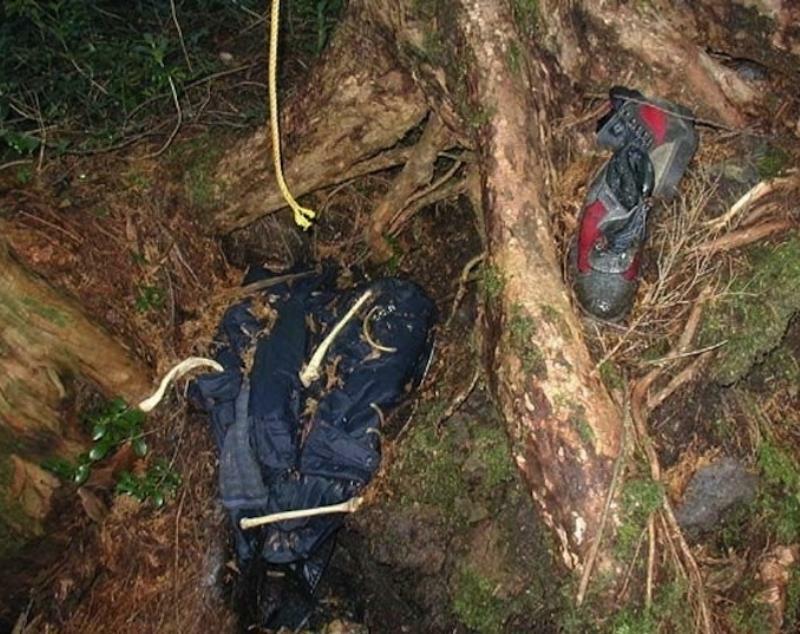 The more recent tag of the ‘Suicide Forest’ began to dog the region after tourists began to encounter decomposing bodies in Aokigahara in the 1950’s. Since the early 1970’s, a small army of police, volunteers and journalists annually scour the area in search of bodies. It is believed that the penchant for suicide in the area stems from the 1960 novel, ‘Wave of Trees’ by Seicho Matsumoto, in which the protagonists commit suicide in Aokigahara forest. The death rate has shown a significant annual increase, reaching a peak in 2004 when 108 people committed suicide in the forest. The sight of hanging bodies in the forest is common, as is the sight of animals feeding on yet undiscovered corpses. In 2010, 247 people attempted suicide in the forest, though only 54 were successful. A disquieting reminder of the forest troubled history are the scattered personal belongings found throughout the forest from previous suicides. 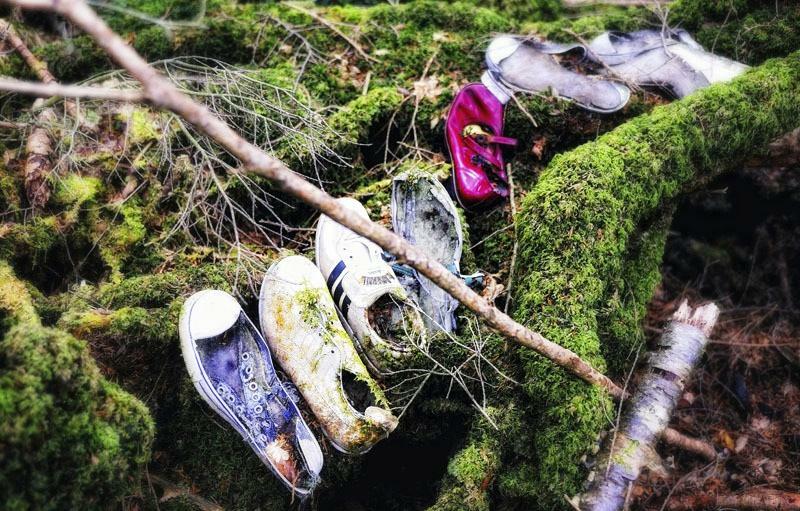 Moss covered shoes, photographs, briefcases, notes and ripped clothing have all been discovered strewn across the forest floor. Very interesting story and a real eye opener. 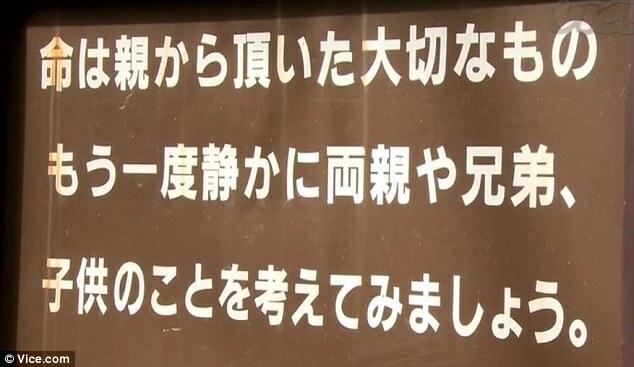 In japan, they go to forest and wait and die. In taiwan, they burn charcoal in car or house. In singapore, they jump mrt or go to bedok reservoir. In USA, they buy rifles, shotgun, handgun and 6000 bullets online. They should take up photography. It'll cheer them up in no time at all. Say cheese and smile for the smile detection activation. Shoot and shoot and nobody get hurt. That is the idea. Shame is a big thing in Japan. I do not like Jap society, too many teachers who like scolding people. Try faking your own suicide and then observe the reaction. If nobody cares, then you should just go ahead and die. But if someone cares, then you re-consider. You don't want to hurt someone by your death. Bad karma.